When most people think of 3D printing, they think of the typical additive process, in which layers of material are fused into the desired end shape. However, additive manufacturing cannot always pull off the perfect final product alone. 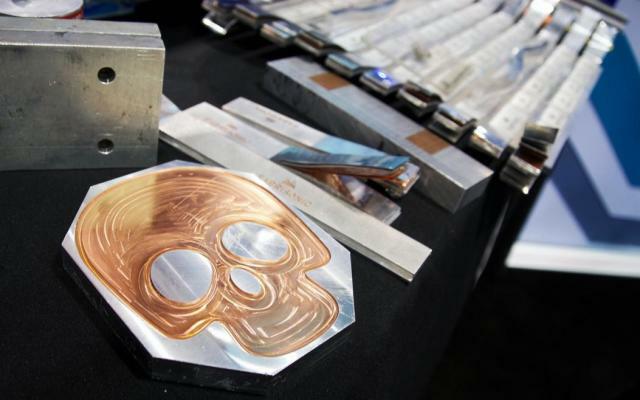 In fact, most metal 3D printing processes require additional milling or other finishing methods to create the ultimate part. For this reason, there are a number of companies, such as Mazak, DMG MORI and Cincinnati Inc., that combine additive and subtractive processes to achieve a given result. One company stands out for a novel hybrid manufacturing technology called ultrasonic additive manufacturing (UAM). By using sound waves, rather than heat energy, Fabrisonic’s UAM platform can be used for applications that no other system can. In an interview with ENGINEERING.com, Fabrisonic CEO Mark Norfolk explained that a UAM machine is actually a CNC mill with built-in ultrasonic welding technology. Thin foils of metal are laid on top of one another and then welded together with ultrasound. The mill can then be used to cut away at the dense stack of metal sheets to create the final part. With 80 percent of revenue obtained through manufacturing services, rather than selling its equipment, Fabrisonic has found that a number of customers request the incorporation of thermocouples into metal parts. Embedding a thermocouple into a metal component, rather than fixing it to the outside of a part, both allows the thermal sensor to provide a temperature reading from a hot or chemically reactive environment and shields the thermocouple from those potentially hazardous environments. With the proper thermal feedback, the customer would have a better understanding of how to control the flow rate of these chemicals. Prior to getting those sensors in place, it was necessary to use a very slow flow rate in order to prevent any issues with the chemical mixing process. This same process can be applied to a wide variety of electronics, including accelerometers, strain gauges and even fiber optic cables. Through a NASA Small Business Innovation Research award, Fabrisonic has been able to work with a number of partners to explore the possibilities of embedding fiber optics into metal parts to monitor the overall stress affecting a component. The Fabrisonic CEO further explained that a single 100-micron fiber can have up to 100 strain gauges on it, making it possible to thread those gauges throughout a part. In an airplane wing, a part containing a fiber optic cable could line the leading edge and provide critical health monitoring data related to the overall life of the wing. The technology also has applications in the oil and gas industry, where FBG could detect the strain of parts down a well or along miles of oil pipelines. Norfolk pointed out that it would be particularly useful in detecting the wear of pipes caused by earthquakes. Having completed phase one of the project, the company is now embarking on the second phase, in which it will actually commercialize the product. Fabrisonic is performing the qualification and optimization of the technology during a two-year period, with Norfolk anticipating the incorporation of FBG into a flight article. 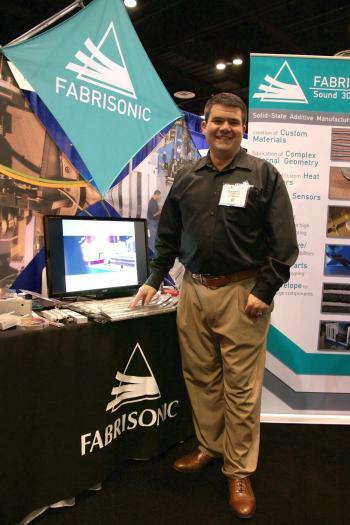 The ability to combine dissimilar materials has also allowed Fabrisonic to manufacture parts with other unique properties, leading customers to order products with custom thermal expansion or elastic properties. To demonstrate the potential, the company 3D printed a metal matrix composite in which aluminum was blended with continuous ceramic fibers. “A normal composite may be made of carbon fiber plus an epoxy,” Norwalk pointed out. “Instead of epoxy, the [metal matrix composite has] aluminum, so yield strength is much greater. Instead of carbon, there are 200 [kilopound per square inch] ceramic fibers.” As a result, the parts are low in weight, but extremely strong. At the same time, due to the use of aluminum, the parts can be arc welded to another conventionally manufactured structure.